King of Clay Rafael Nadal. 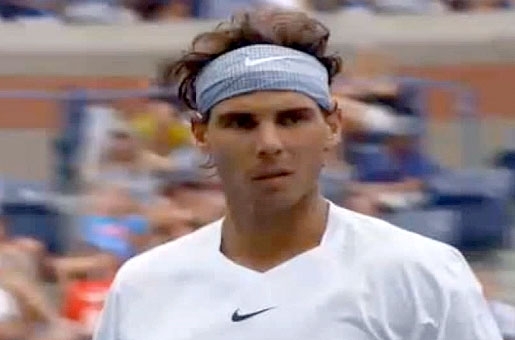 IT alls seems so easy for Rafa Nadal as he brushed aside American Ryan Harrison 6-4, 6-2, 6-2 at the US Open. That means that Rafa is still unbeaten on hard courts in 2013, with a record of 16-0. So the King of Clay, who is almost untoucheable on the surface as proved by his French Open win, is not too shabby on hard courts either. It shows what a magnificently versatile player he is. It was his first match at the US Open since the 2011 final loss against Novak Djokovic. He missed out last year after surgery to his knee. Elsewhere in a rain delayed event both Williams sisters breezed through. Serena had a 6-0, 6-1 win against Francesca Schiavone of Italy, and Venus, now a lowly number 60 in the world, had no trouble dispatching number 12 seed Kirsten Flipkens 6-1, 6-2.